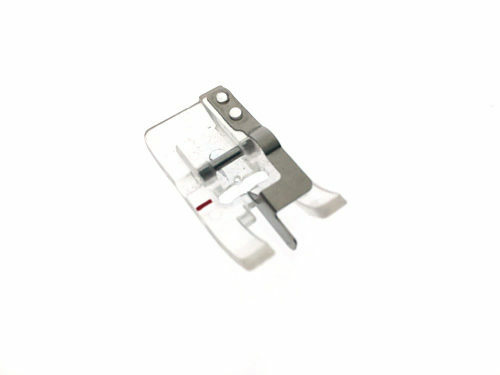 Everybody on the (quilting) planet has a 1/4″ piecing foot, but do you know what other feet you should keep handy? Read on! 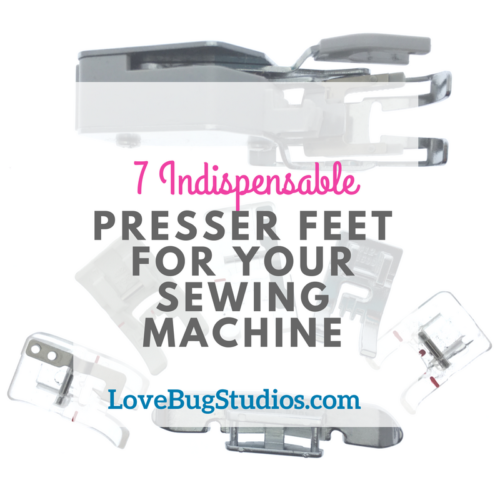 I went through my sewing box (I keep all my presser feet in a large, clear, divided container by the way) and identified all the feet I use the most, and thought – hey! Everyone should have these feet! Over the years, these feet have helped me sew different materials with success, perfect stitching techniques, and add special touches to my favorite projects. Since I stitch on a Viking Designer EPIC and am a Viking Ambassador, I’m also including part numbers if you have a Viking machine and would like to add any of these to your collection!! 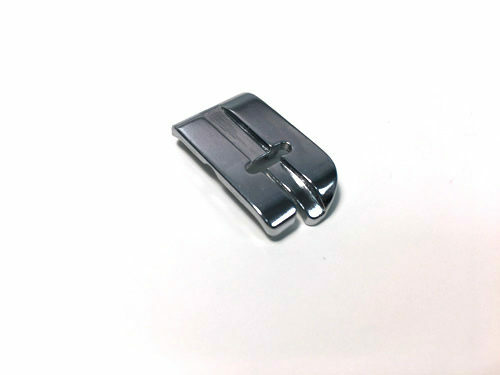 If you’re stitching on things like leather, foam, PUL, and especially vinyl, this kind of foot can be indispensable! I love using clear vinyl for things like clear pockets or protective covers when I’m sewing accessories, and this foot is awesome to use. This project had a fair amount of vinyl to make all the pockets, and having a non-stick foot was definitely indispensable! 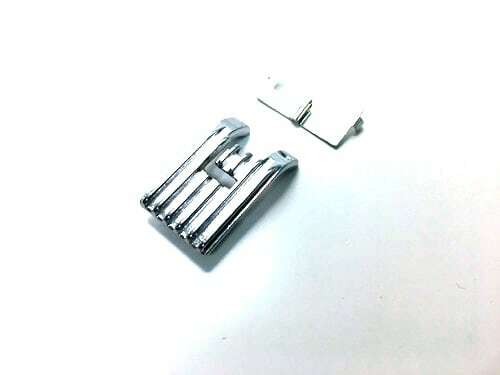 This is the metal version of the same foot. 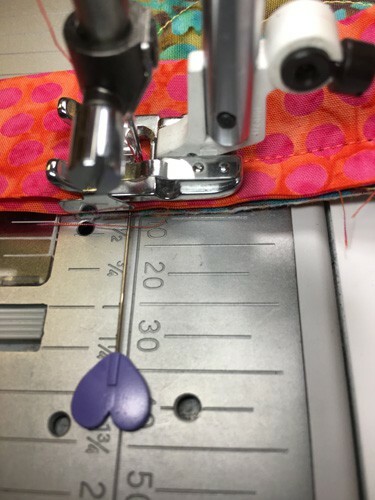 I use this foot for attaching binding to quilts, because I can adjust the position of the needle to get the right depth (based on the batting I’m using) and get a very consistent stitch distance. This is the best foot to be able to see where you’re going! On the Viking version of this foot, there’s a wide groove underneath so as it moves over decorative stitches, it doesn’t get hung up on them. 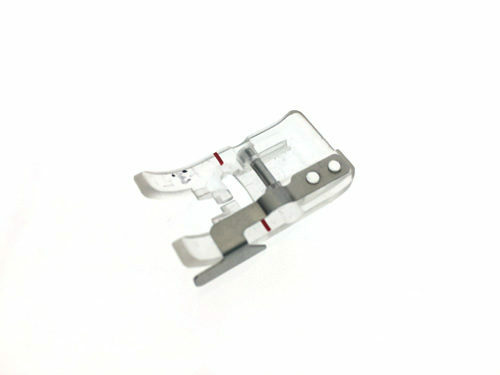 I use this foot most often when I need more visibility to what I’m sewing and need to see exact needle placement. 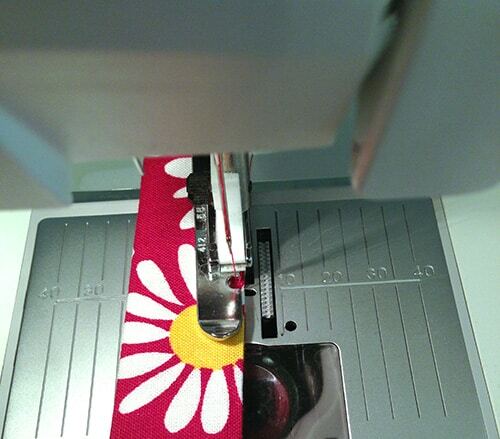 I know there are other feet that are better known for topstitching, but I cannot give up my narrow zipper foot! Obviously, I use it for zippers, but when I need super-narrow topstitching, this is the foot I turn to. 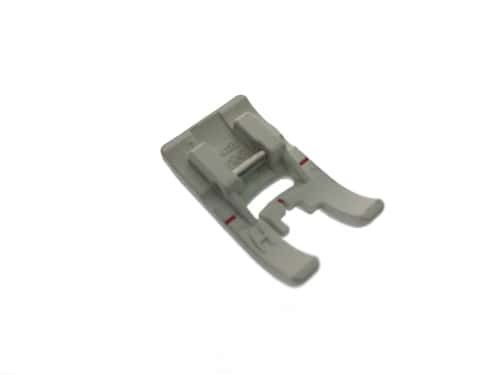 What’s great is that as a snap-on foot (which is amazing – so fast to change feet!) it has two positions, so you can position this foot to the left or right of the needle. If I have a bulky project like a quilt, I can always keep the bulk to the left of the machine, and just reorient the foot based on where I need to stitch. Here, you can see the foot holds the fabric securely, and I can topstitch ridiculously close to the edge. I think everyone should have a fun foot in their collection. This is one of my favorites. The pintuck foot comes in many different varieties – 3-groove, 5-groove, 7-groove, and even a 9-groove! The secrets to great pintucking involves a twin needle and a raised seam plate (that’s the weird forked attachment pictured.) The foot has grooves for the pintucks to travel in as they are stitched, to keep your pintucks spaced evenly, and the raised guide scrunches the fabric a bit so you get a nice dimensional pintuck. This adds such a nice detail to simple projects. Even if you don’t do a lot of embellishing normally, this can really punch up the front of a pouch, or give you a dimensional element to plain blocks. You can even pintuck a grid! My advice if you plan to do a lot of pintucking is to pintuck first, cut to size later. It doesn’t take a lot of fabric, but the pintucking does shrink your pieces. This is similar to the Edge Guide Foot, but the guide is in the center positioned in line with the needle. This foot is great for stitch-in-the-ditch, but I also love using it to join scrap pieces of batting together to make a single, large piece for projects. No more wasted batting! I used to use this foot for stitching bindings by machine, but check out foot #7 for my replacement. Okay, I will admit this foot is a fairly new acquisition for me; however, it’s going to be in heavy rotation now that I’ve found out what this foot can do. I bound 9 quilts during the month of January, and this foot helped me get them done in fairly short order. This is a foot that’s a bit hard to photograph, so let me explain it. The foot itself is not flat across the bottom. The right side of the foot (looking at it from the front) is raised higher than the left side. 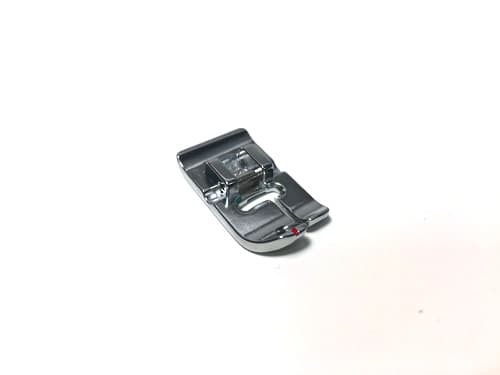 What this does is create a little shelf for the foot to sit on, so that if you’re stitching on different thicknesses of fabric, you don’t get distortions in the fabric while it is feeding. My bindings are stitched completely by machine these days, and I usually finish with a narrow zigzag, but I started experimenting with a straight stitch finish. This used to be such a hassle, and I am now fairly confident that I can do this more successfully using this foot. Look at that stitch! There you have it! My recommendation for 7 feet that should be in your lineup of feet. At least two of these feet get used on every project, so I definitely feel like these were a great value to me over the years. 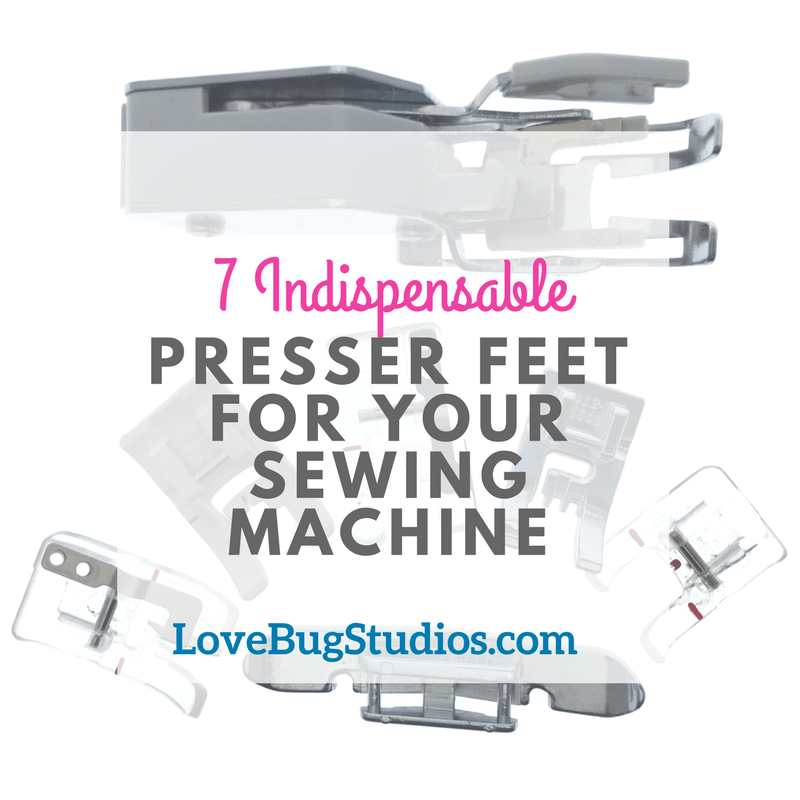 What feet do you have in your sewing box that you consider indispensable? Tell me about it in the comments! This post is part of the 2017 Back to School Blog Hop hosted by Sam Hunter of Hunters Design Studio. Be sure to check out all the other fantastic posts in the series over the next 30 days! The blind hem foot is my go to foot for top stitching patch pockets. With the needle all the way to the left, you get nice tidy stitching. I recently discovered the stitch in the ditch foot – and I am digging through my attachment box for a couple more you mentioned! 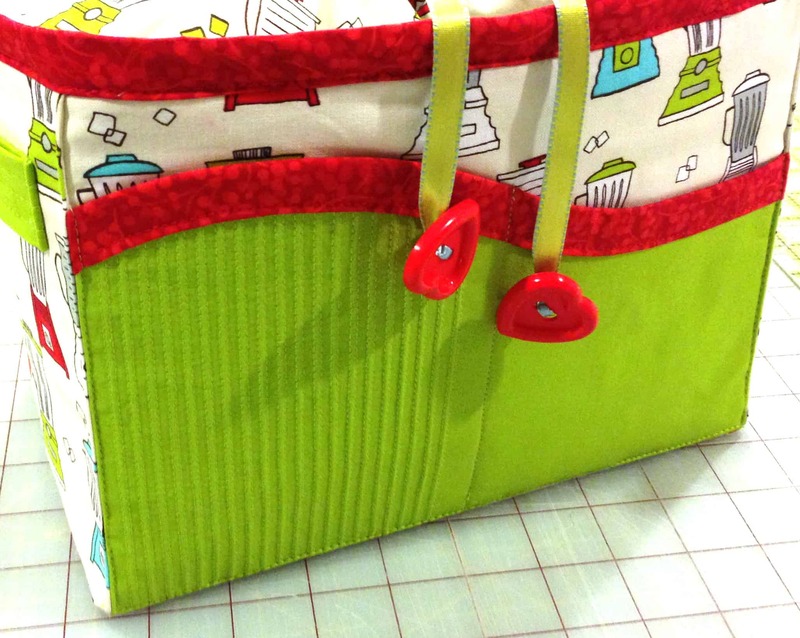 I am a JoAnn’s quilting instructor and I would love to share this information with my students. Is it alright for me to do this? I have Viking Opal machines in my classroom so I could also demo the feet that have to do with quilting. I have been using these feet for years but have never seen such good advice on how to use them. 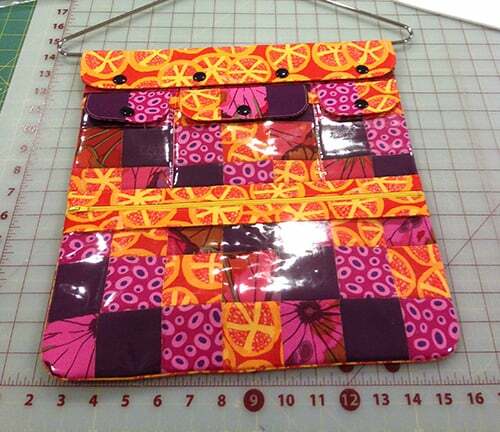 Thank you so much for sharing this with us Crazy Quilters! Hi Linda! Absolutely, I would be honored for you to share it with your students! Wow, that left topstitch foot is going on my wish list! Thanks so much for sharing. I’ll be pinning this list for sure. What a gem. I am intrigued by the idea of machine binding with the left top stitch foot. 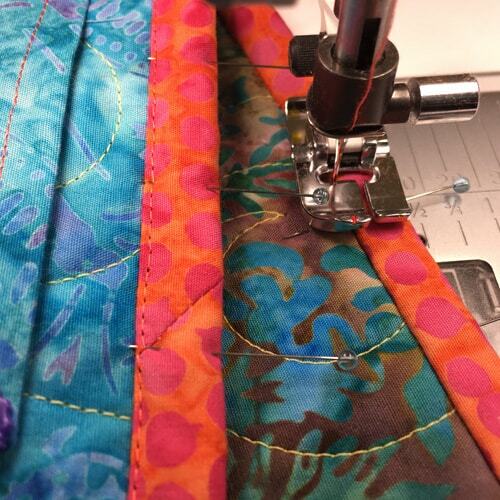 I hate hand sewing the binding on my quilts! 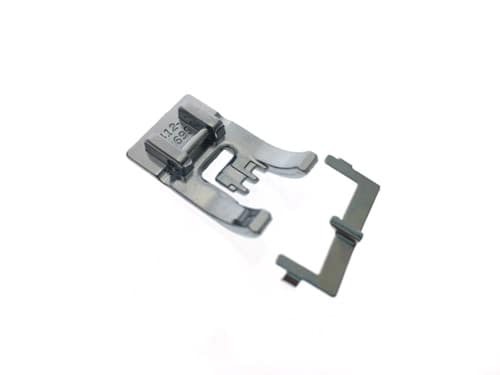 Could you possibly do a tutorial on machine binding using this foot? I have a Huskvarna Viking sewing machine which I love too! Thank you for sharing about my he different pressure feet available. 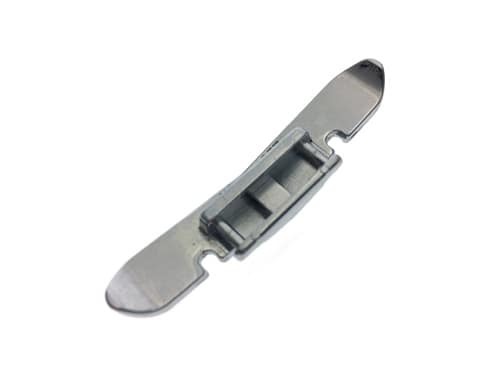 I have quite a few but you showed me new ones like the narrow zipper foot.